Grant Morrison: "It was 1 a.m., in an airless hotel room, overlooking the naval yards of San Diego Harbor. I found myself chewing over the interesting problem of re-creating Superman for the 21st century, with my editor Dan Raspler. To clear our heads, we went downstairs and crossed the street to a Dr. Seuss-ish park between the rail tracks and the city. We were deep in discussion, debating earnestly the merits and demerits of a married Superman, when we spotted a couple of men crossing the tracks into town.One was an ordinary-looking bearded dude, at first sight like any of a hundred thousand comics fans. But the other was Superman. He was dressed in a perfectly tailored red, blue and yellow costume; his hair was slicked back with a kiss curl; and unlike the often weedy or paunchy Supermen who paraded through the convention halls, he was the most convincing Superman I’ve ever seen, looking like a cross between Christopher Reeve and the actor Billy Zane. I knew a visitation when I saw one.Racing to intercept the pair, Dan and I explained who we were, what we were doing and asked “Superman” if he wouldn’t mind answering a few questions. He didn’t, and sat on a concrete bollard with one knee to his chest shield, completely relaxed. It occurred to me that this was exactly how Superman would sit. A man who was invulnerable to all harm would be always relaxed and at ease. He’d have no need for the kind of physically aggressive postures superheroes specialized in. I began to understand Superman in a new way. We asked questions, “How do you feel about Lois?,” “What about Batman?,” and received answers in the voice and persona of Superman — “I don’t think Lois will ever really understand me or why I do what I do …” or “Batman sees only the darkness in people’s hearts. I wish he could see the best …” — that seemed utterly convincing.The whole encounter lasted an hour and a half, then he left, graciously, and on foot, I’m sad to say. Dan and I stared at one another in the fuzzy sodium glare of the street lamps, then quietly returned to our rooms. Inflamed, I stayed awake the whole night, writing about Superman until the fuming August sun rose above the warships, the hangars and the Pacific. 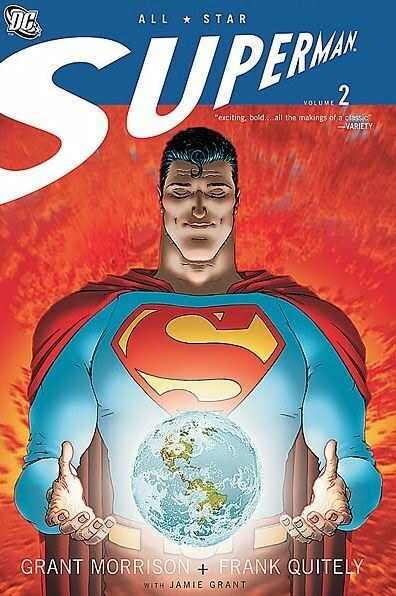 The end result was my 12-part “All-Star Superman” series with artist Frank Quitely so it was definitely worth it." No question: This is the best Superman story of all time. One blogger  has even gone so far as to list 167 Reasons why it's his favourite superhero comic of the last decade and not only do I agree with every reason he listed (favourite examples include: "The way Lois kicks up a tiny cloud of lunar dust as she embraces Superman on the moon", "Clark's unreadable expression while he holds the punching bag for Luthor", "Superman is shooting tiny versions of himself out of his fingertips, and they can cure cancer, and it all makes perfect sense") - but it feels like there's 167 reasons more that he didn't include. Because - yeah - undoubtedly Superman is the best superhero of all time. He was the first. He has all the main superpowers that any self-respecting superhero needs (namely I guess: super-strength and flying ) and he's got all the cool iconography: that spit-curl, the cape and - of course: that chest-mounted "S". But for those of us who actually - you know - read comics: the problem with Superman has always been that although there are seemingly hundreds and hundreds of Superman books out there there are very few that are actually worth reading . Yeah - there's Red Son and Secret Identity: but it's not a great sign that those are both non-canon "Elseworlds" style titles that - technically speaking  aren't really about Superman at all (more like Superman-counterparts or Supermen of other dimensions): and - oh yeah - there's Alan Moore's Whatever Happened to The Man of Tomorrow? : but that was just 2 issues so it's a bit slight - and seeing how it's supposed to be the last Superman story ever told - it's more like a capstone than an actual story in-and-of-itself: something that only makes sense in relation to all the Superman stories that came before it. And then - well: up in the sky! Is it a bird? It is a plane? No - it's the just best Superman story of all time. It's All Star Superman. Or (even better) as the name of the last chapter has it: Superman in Excelsis! (Which I think would have made a pretty good alternative title). 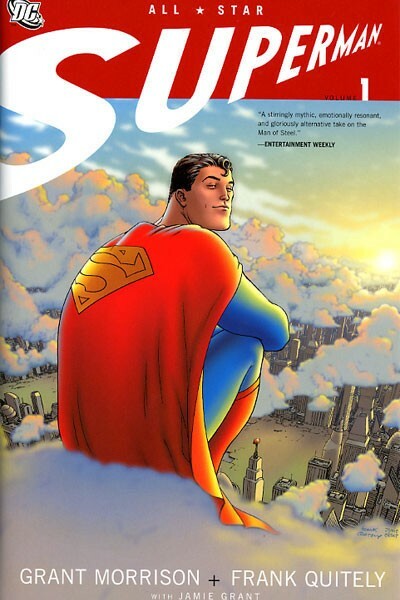 Grant Morrison and Frank Quitely distill all the awesome aspects of the Man of Steel into his most timeless, essential and iconic elements - like they say it's "an honest attempt to synthesize the best of all previous eras." With things like Watchmen and The Dark Knight Returns and all the millions of inferior books they spawned there's been a decades-long industry standard of making superhero books grim n' gritty and dark and mean with very few books around to indicate any sort of way out. Lots of people kinda hunkered for a sorta return to the Silver Age of Comic books  before all these unwelcome ("welcome to the real world"  aspects started to creep in). But unlike say - Alan Moore's Supreme - which was happy enough to just recreate the happy-go-lucky plots of prime Silver Age superhero stories (not that there's anything wrong with that): All Star Superman synthesises all the elements into something brand-new and modern: a book that builds on everything that came before but doesn't do so with a sense of nostalgia - but rather takes everything that's been done up until this point and then uses it to go even further: into the future. With pretty much ever cool and uncool Superman cliche present and correct - from Jimmy Olson's signal watch to Bizarro from Krypto the Superdog to the Fortress of Solitude  - it's a delight for fans: but with no back story knowledge required (although who doesn't know Superman?) - non-fans are just as welcome . On the surface - the story is simple and elegant - cutting to the chase on the very first page: "Doomed planet. Desperate scientists. Last hope. Kindly couple." and then from there it's an almost non-stop barrage of outlandish concepts (nanonauts, genetically modified suicide bombs in human form, voyager titans, armies of flesh-eating dinosaur men, tungsten gas life forms with brittle glass exoskeltons and highly dangerous experimental stem-cell accelerators!) and everything pushed up to 330,000: "Imagine one hundred billion H bombs exploding in your face, Miss Lane... per second." But there's lots and lots of hidden delights and intricate brain-twisters for the careful reader to discover, unpick and enjoy (check the links below ) as well as a show-stealing performance from Lex Luthor who's better here than he's ever been anywhere else (and that includes Gene Hackman's devilish performance in the 1978 Superman film just so you know that I'm not kidding around...): he's consistently entertaining, smart, funny and always scrupulously underhand ("Robot 7... must atone... Solaris invaded neural net... Solaris stole formula... stole for Luthor..." / "Thanks to a serum only I could have invented." made me giggle quite a lot). And oh my god wonders will never cease (and this is how you know just how good it is) for once Grant Morrison manages not to fluff the ending but actually manages to create a moment that not only makes sense - but also goes further and becomes something that actually manages to feel strangely transcendent ("And we're all we've got.") Showing us that the "Super" part of "Superman" comes not from the fact that he's got all those super-strength, flying powers etc and it's not because if he meets a threat he can just smash it into submission: but more from his ability to see the best in everything - and - well - the fact that being able to multi-task like a madman (I love it when it all starts coming together in the second volume: the massive rush of information and plot points hitting like a big fat beautiful wave of "omg!" moments). Basically: Even if you hate Superman, even if you hate superheroes, even if you hate comic books: there is something in here for everyone to fall in love with and make you gasp with wonder and joy. Superman the way you remembered him in all your best dreams - and the way you always wished he could be again. That cover for Vol 2 above? With Superman with the world suspended between his hands - with that beatific look on his face? That's the way you'll feel reading it: safe and secure in the arms of a higher power. Hell yeah or - (should I say it? ): Super. Man. Bob Temuka at the Tearoom of Despair see: here: (but have also put him down in the links below - you know - just to be sure). Altho - as I found out through reading Men Of Tomorrow: Geeks, Gangsters, and the Birth of the Comic Book - at the start Superman was just really good at jumping (thus: "able to leap tall buildings with a single bound") and the writers stole the flying idea from another character (Yonk!). One of the librarians I work with at North (who's great and super-fun to work with) has a T-Shirt with a Superman "S" on it - even tho he never reads comic books and still seems bemused by the monthly Comic Forum meeting ("I thought it would just be children..."). Especially when you compare him to Batman who has wicked epoch-defining Batbooks coming out his spiky little Batears (just check that right hand column and look for how many books there are tagged with "Batman"). Which mainly consisted of people (well - actually - it was mainly women) either being raped or murdered. Or - if you were lucky: both. In fact if you want to see how bleak things got then check this list out: "Not every woman in comics has been killed, raped, depowered, crippled, turned evil, maimed, tortured, contracted a disease or had other life-derailing tragedies befall her, but given the following list, it's hard to think up exceptions." In fact - if you wanna go there: the best way to describe All Star Superman is that it's like a Superman hyper-story (that's a thing right? That sounds like something Grant Morrison would say...). It begins with lots of backstory already built in off-page - all the stuff that we all already know: Lois Lane has been trying to prove that Clark Kent is Superman for years and years and years and Lex Luthor has been trying to destroy Superman (and constantly thwarted) for the same amount of time. So far - so much like the Superman that everyone already knows: but then there's all this stuff that kinda refers to all the big Superman stories but does so in such a way that you can't really be sure what exactly happened: did they have Doomsday kill Superman in this world (They have the same eagle-on-his-hand tombstone at the very least)? Has Superman meet Bizarro before (there's a bit where he says that "Bizarros have never been organised or as hostile as this before" which seems to suggest that he has - but then the Underverse seems like a new discovery - so I dunno )? Plus there's also Solaris "The Tyrant Sun" who was created by (yep) Mr Grant Morrison in a series called DC One Million that was published in 1998 ("It featured a vision of the DC Universe in the 853rd century (chosen because that is the century in which, if the company had maintained a regular publishing schedule, DC Comics would first publish an issue numbered one million (specifically, Action Comics, their longest running title)") - which makes him part of "official continuity" and who then acts in exactly the same way: that bit where Superman says "By the 24th Century, I'm told, you'll have been rehabilitated to work with humanity instead of against them."? I think that's a DC One Million reference (but it's hard to be sure because it all sounds pretty complicated: something about Pancosmic Justice Jihads and time loops and stuff like that... But hey I guess: it's an imaginary story - aren't they all? (So just shut up and enjoy it already). In fact it kinda reminds me of that bit in Aliens ("Is this gonna be a standup fight, sir, or another bughunt?" "All we know is that there's still no contact with the colony, and that a xenomorph may be involved." "Excuse me sir, a-a what?" "A xenomorph." 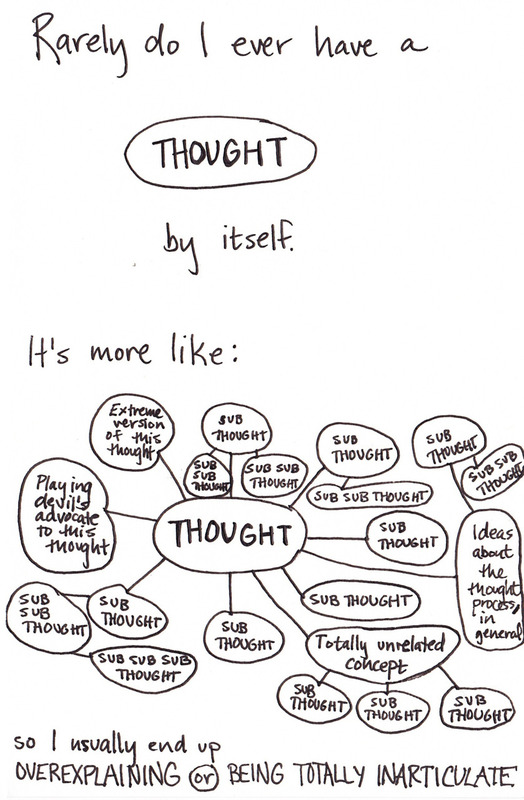 "It's a bughunt.") Doesn't that mean that if they've already got all that terminology in place ("xenomorph" "bughunt") and Hudson says is this gonna be "another bughunt" then doesn't that mean that they've already dealt with those aliens before somewhere else? In which case - why are they so surprised? My favourite crazy theory (that's probably true) is the one that says that Leo Quintum is a future version of Lex Luthor. Check the Mountain of Judgement artile: "All-Star Luthor: Xs and Os" and Guilty Displeasures' (much less ambiguously named): "Leo Quintum is Lex Luthor" below: (Quote: "After Superman leaves to reignite the sun, Luthor has a year to think about it--a year in which, according to the epilogue, even he is moved by Superman's memorial service, and, as Quintum himself says, the villain diminishes in the absence of his rival. So, let's say you're Luthor. Superman's finally gone, the world looks different to you now, and his final statement is ringing in your ears. Maybe you give up and let yourself be executed, as the overt text seems to suggest.Or maybe you disappear, travel back in time, don a pair of glasses as a foolproof disguise, (plus some hair plugs, switching the X in your name to an O, and adding some colors to your old coat) and you become the man Superman always knew you could be."). Hell just check out page 24 and page 30 in the first Vol and you can see it staring you in the face. Altho: if you do wanna nitpick (and hey - why the hell not - right?) Then I would question the mixed messages sent out by that panel of Superman declaring "Brain beats brawn every time!" at the exact same instant as he punches Luthor in the face. Links: Newsarama Grant Morrison Interview, I Am Not The Beastmaster Review All-Star Superman #1 / #3 / #5 / #10 / #12 / Vol 2, Death to the Universe Review, Mindless Ones Article, The M0vie Blog Review, Sci-Ence! Justice Leak! Article: Eschatology & Escapology 2: Desperate Scientists, Last Hope, Mountain of Judgement: All-Star Luthor: Xs and Os, Guilty Displeasures: Leo Quintum is Lex Luthor, Tearoom of Despair: 167 Reasons Why All Star Superman Was My Favourite Superhero Comic of The Last Decade, Matt Seneca Comix Article: Life on Earth Q: Love, Childhood, and All Star Superman (Part 1) / (Part 2) / (Part 3). Further reading: We3, Flex Mentallo, The Filth, Superman: Red Son, Batman: All Star Batman and Robin, Ultimate Spider-Man, JLA: Earth 2, Kingdom Come, Supreme, Joe The Barbarian, DC: The New Frontier, Superman: Secret Identity, Superman: Birthright. Profiles: Grant Morrison, Frank Quitely.